Get to know Michael Stone! Posted November 10, 2016 Home / Ottawa Yoga Blog / Events / Get to know Michael Stone! 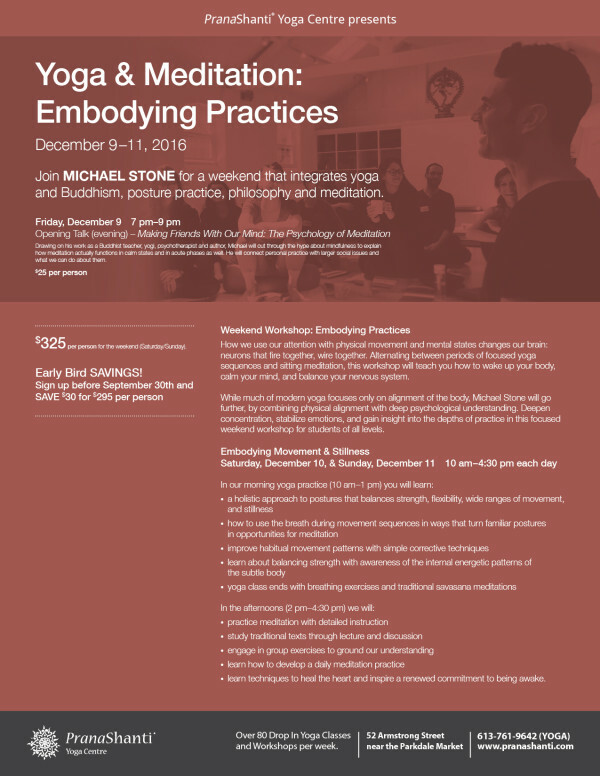 We are delighted to welcome Michael Stone back to PranaShanti on December 9-11, 2016 for a Master Class Weekend on Embodying Practices. Before Michael’s arrival you may like to listen in on some of his podcasts to get a feel for his teaching. The Dharma Talks podcast with Michael Stone is a library of talks on a wide-range of topics, including bringing mindfulness and meditation practice into daily life; personal and community issues regarding mental health; and social change. The podcasts are recorded at live events so you might hear coughing, airplanes, cars, sirens, laughter, and peoples’ questions—all part of the intimate experience. Michael Stone is often described as a cross between a spiritual teacher and public intellectual. His ability to integrate traditional contemplative teachings from his studies in yoga, Zen, and Vipassana, with the insights of Western psychology, gives him a unique voice for a new generation of students integrating mindfulness with the demands of their busy lives. He is the author of numerous books, he teaches internationally and lives in Canada.